The night before you want to make the pulled chicken, place the thighs, garlic, onion, chili sauce, liquid smoke, ginger juice, hot sauce, salt and pepper in a resealable bag or marinating container. Mix to coat the chicken in the other ingredients. Refrigerate. The next day, add the contents of the marinating container and all remaining ingredients to a 2 quart slow cooker. Cook on low in the slow cooker 1 hour on high plus 2 1/2 hours on low or 3 1/2 hrs on low. When done, meat should shred easily with a fork. Shred chicken with a fork. Toss to evenly coat with sauce. Serve on rolls. *I used the Captain Mowatt's Fireberry Sauce that I picked up on a trip to Maine. I think another fruity yet hot hot sauce would work but if you can find it, pick up a bottle! I've been trying to think of some easy dinners lately due to my work and my husband tearing his ACL and meniscus during some vigorous kung fu that are still crave-worthy. My old friend the slow cooker (Have you ordered my latest book yet? The Big Book of Slow Cooker Recipes: More Than 700 Slow Cooker Recipes for Breakfast, Lunch, Dinner, and Dessert is available now!) has come to my rescue more than once. Boneless, skinless chicken thighs are cheap, tasty and perfect for the slow cooker. 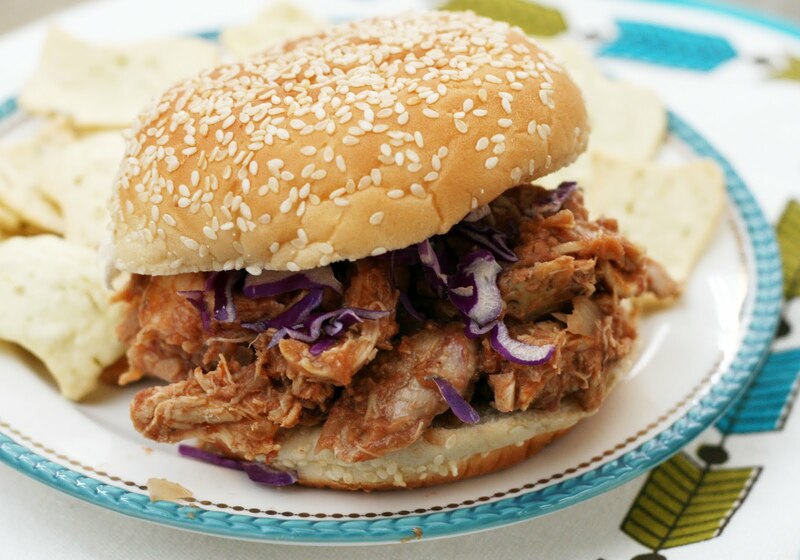 Unlike boneless, skinless breasts, they stay moist and shred with ease; perfect for pulled chicken. I went for a tangy, fruity yet not too sweet sauce than thanks to the overnight soak, really permeated every inch of the chicken.